‘Lifebox® a vital tool for saving lives across the globe’: March’s edition of the ANZCA bulletin features the work of Lifebox Australia and New Zealand (ANZ), their highlights and the importance of addressing surgical challenges in the Asia Pacific region. ‘Lifebox and Safe Surgery’: Dr Alex Haynes talks to this popular surgical podcast about the route to a academic surgical career, the broad aims of Lifebox, and the important difference between a ‘global surgery’ and person who works in surgical safety. Dr Mansi Tara talks the the RCoA about our team-centered approach to safer anaesthesia in India. Clean Cut®, our surgical site infection reduction project piloting in Ethiopia, is showing compelling results. Read more from the Stanford research side here. The Lifebox Masterclass series was back by popular demand at this year’s American Society of Anaesthesiologists Annual Meeting held in Boston. ASA Daily News reported on scheduled speakers sharing global perspectives. In this interview with the ASA Daily News, The Checklist Effect Director, Lauren Anders Brown discusses this award winning film about surgery anaesthesia on a global scale. This film, produced by Lifebox, was screened at the ASA’s Annual Meeting this year. “If not for the ‘beep, beep, beep’ provided by the Lifebox, there would not be any monitors, period.” Moving account from recipients of the 2016-17 ASA Resident International Anesthesia Scholarship. Drs Brown, Cloyd and Simmons spent a month working with local colleagues in Uganda as part of a programme sponsored by the ASA Committee on Global Humanitarian Outreach. “In the quest to end preventable maternal mortality, safe surgery deserves greater attention as a key strategy, said advocates gathered at a UN General Assembly side event,” – including Lifebox Global CEO Kris Torgeson. Read more in GHN’s coverage. Recap of the August screening of The Checklist Effect hosted by the Global Surgery Students Alliance chapters of Harvard Medical School, Boston University Medical School and Tufts University Medical School. This was followed by a panel discussion including Lifebox Chair, Atul Gawande. So proud to have been part of this global maternal health campaign featuring Lifebox colleagues Drs Mary Nabukenya and Rediet Shimeles – who share their perspectives on why surgery and anaesthesia are essential components of maternal health. Our friends at the ASA ran this warm and welcoming profile of our Global CEO Kris Torgeson. Reflecting on Kris’s long humanitarian career, her decision to join Lifebox, and the essential support of the anaesthesia community. The Lifebox oximeter can withstand extreme heat and cold and the battery is functional for at least 12 hours. Crucially, it is also tough, and can be dropped from table height without breaking. “It’s not going to break down soon after arrival, a serious problem with medical equipment in low-resource countries,” says Gawande. As Gunbileg was carried into the emergency room in May last year, a nurse placed on his finger a small peg-like device attached by a wire to a battered-looking yellow monitor the size of a mobile phone. “The little yellow box that’s made thousands of operations safer.” Millions of people are left dead or disabled by surgical complications each year when one simple piece of kit could have saved them. Jane Feinmann discovers how it has helped transform medicine in Mongolia. Check out this broad technology media platform as it focuses a lens on technologies in global surgery – including the Lifebox oximeter, and our environment-appropriate impact. One of our innovation projects scoping the ideal low-resource setting surgical instrument tray takes the spotlight in this interview about surgical site infection, life-threatening challenges, and the vital role that perioperative nurses have to play in this global challenge. 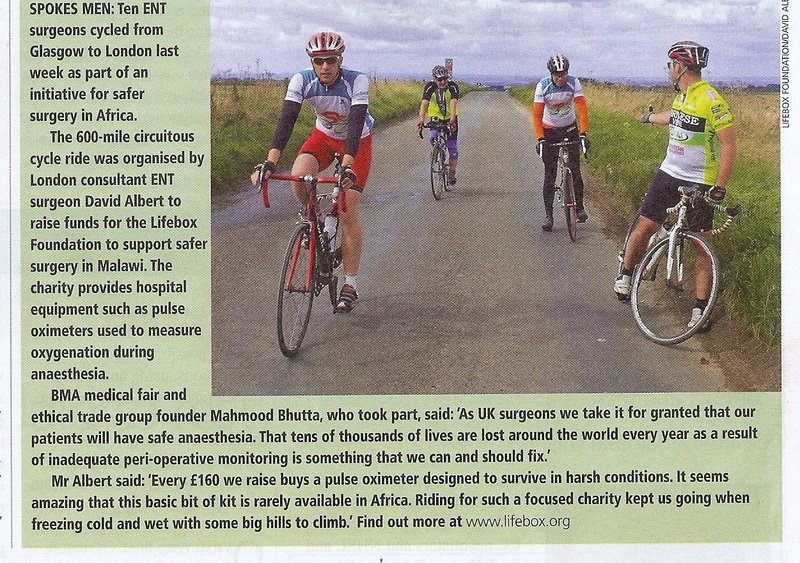 Lifebox champions Drs Laura Irwin and Reza Noori – who are cycling the length of the Andes to raise funds for our safer surgery work – share they amazing adventure in this edition, starting on page 40. La Creatividad Aplicada a la Medicina – Creativity Applied to Medicine. We’re thrilled to see our beautifully animated and practical multi-language pulse oximeter educational videos featured in this creative culture magazine. Lifebox trustee and educational programme lead, Dr Angela Enright discusses our work in distributing pulse oximeters and training anasthesia providers around the world. Laura Irwin and Reza Noori have been on the road for a year, having sold everything they owned to undertake a 15 month cycle across the Andes in support of Lifebox. Read more about their painstaking adventure! Melinda Beck writes about the challenge of healthcare innovation in low-resource settings – with a spotlight on the success of the Lifebox environment-appropriate oximeter, education and distribution model! La donación de los 320 oxímetros de pulso al país, es uno de los mayores eventos de donación y formación que Lifebox ha llevado a cabo en sus cinco años de creación, con más de doce mil oxímetros donados en alrededor de cien países. Lifebox trustee and former President of the American Society of Anesthesiologists, Dr Alexander Hannenberg named as the 2015 ASA Distinguished Service Award recipient. This is the society’s highest award for exceptional service and achievement. We’ve worked closely with the New Zealand Society of Anaesthetists to support colleagues in Vietnam with essential equipment and training. So we were thrilled to read this latest update from the NZSA’s Dr Peter Schenk on his recent trip to Vietnam. Sharing the stage with long-term partners Smile Train to demand investment in sustainable access to safe surgery worldwide. Lifebox chair, Atul Gawande talks safe surgeons, transparency, health systems and much more in this thought provoking feature. Every year we learn something new at the American Society of Anesthesiologists’ conference – and this year in San Diego we wanted to give something back! Our second ‘Masterclass’ series was a chance for global anaesthesia experts to share their experiences, and listen to yours. We joined forces with this maternal health NGO founded by World Health Organisation Goodwill Ambassador and supermodel, Liya Kebede, to showcase our work in Niger. ‘Anestesiologos buscan prevenir morbimortalidad en quirofanos’ – aka safer surgery and the WHO Checklist are making headlines worldwide! We were thrilled to see the Ministry of Health and the press taking such urgent interest in a recent Dominican Republic conference we took part in. In print and translation. Award-winning medical show The Cure takes their camera behind the scenes in Uganda, showing how the Lifebox oximeter and WHO Checklist are helping colleagues to make surgery safer. American audiences can watch the video here, and everyone can read an interview with director Daniel Nikolaison here. We work with humanitarian heroes every day – and on World Humanitarian Day, we had the chance to celebrate them. Surgeon Edward Fitzgerald explains why our OR colleagues should be heroes in everyone’s eyes. Project Benin Saturation 100% was a collaboration between Lifebox, a Rotary Club in Genk Staelen, Belgium and one in Cotonou, Benin, and Rotary International. It did exactly what it set out to do. Read all about the life-saving, continent-crossing teamwork here! Salil Patel doesn’t ask – he tells you why you need to know about global surgery. With updates on IMFSA’s Global Surgery Working Group and key insights from Lifebox® trustee Dr Iain Wilson. Meet our new Fellows! We caught up with Rachel and Nick before their six month placements in Uganda and Ethiopia begin. ‘Born Safe Global – have you heard about it?’ Lisa Cassese, one of our friends over at health communications firm LehmanMillet explains how ‘that balloon’ got its start – and what the Born Safe Global campaign means to her. Lifebox® trustee Dr Iain Wilson was one of the expert commissioners on the recent Lancet Commission on Global Health. Read our ‘profile of a commissioner’ to find out what went in to making this landmark report. “A surgeon who works at Barnet Hospital has been delivering life-saving surgical equipment and training to doctors in Rwanda.” He also works at Lifebox®, and this is a great story! We were thrilled to be part of the inaugural Ansell Cares H.E.R.O. award, in association with our MAKE IT 0® friends at the European Operating Room Nurses Association (EORNA). It honoured the contribution of perioperative nurses, who play such a vital role in safe surgery care – heroes like Enrique Cosme Pereira, who chose Lifebox as his charity. Tune in to Phil Kennedy’s drive home show to hear Dr Guy Jackson explain why, exactly he ran a half marathon dressed as a pulse oximeter – and Dr Nick Boyd, recently returned from Uganda, explain why it was absolutely worth it. Click through to picture 8 of 13 in the gallery of Reading Half Marathon Runners, to see AAGBI Council member Dr Guy Jackson dressed as a pulse oximeter. A beautiful and moving article by Dr Hilary Aitken on why retiring anaesthetists can and should make a difference. The BBC4 Reith Lectures, delivered by Lifebox® chair Atul Gawande, were broadcast to 50 million people worldwide. What on earth did that feel like…? An update from the Zimbabwe Anaesthetic Association – Lifebox has worked with ZAA colleagues to deliver essential monitoring equipment and training to anaesthesia providers across the country. “The secret to surviving surgery in a little yellow box” – Layla McCay gets philosophical and technical about the secret to life. “To speak plainly: obstetric fistula” – haven’t heard of obstetric fistula? You’re not alone. Find out more here. “When ‘lady with the lamp’ doesn’t even begin to cover it: celebrating International Nurses’ Day” – “Glasgow nurses,” The Times columnist Melanie Reid recalls being told, “have hearts like swinging bricks.” A hard substitute for a heartbeat – but in many ways appropriate. “When life-saving surgery turns life-threatening” – Harman Boparai reports from Amritsar, India. Our Make It Zero interview with Dr Lesong Conteh forms the basis for a conversation about a vital and often overlooked aspect of global surgery: gender and economics. The healthcare economist and commissioner on the Lancet Commission on Global Surgery talks about why data matters, why surgery is struggling in the global health arena, and how women are affected. Rotarians support practical projects, and we’ve been thrilled to see clubs across the country rolling up their sleeves to support Lifebox! Read all about it on page 34, or download a PDF here. International Women’s Day is an artificial construct, but so is a banana split. It’s still a rare and delightful invitation to sit down with a spoon or a microphone and talk about issues that affect women around the world. Unsafe surgery is one of them – in fact it’s a full-blown crisis – but it is hardly ever discussed. Residents’ Challenge champion Falan Mouton reflects on the first year of American anesthesiologist trainees putting their commitment to safer anaesthesia and competitive nature to the test! When an equipment donation becomes an unwanted gift. Australian Anaesthetist Simon Hendel, currently based in Laos, reflects. Change of venue for a Lifebox story, but we’re in our element in the Antarctic! Follow Alexander Kumar to ‘Planet Concordia’ and see where we rank in the top 10 items to pack for a cold and remote trip. One for our French-speaking colleagues, announcing our successful collaboration with the national anaesthesia societies of Canada and Burkina Faso to put 117 pulse oximeters into operating theatres across every government hospital in Burkina Faso. Medical manufacturer Teleflex announced plans to donate $25,000 to Lifebox Foundation at the American Society of Anesthesiologists’ 2013 Annual Meeting – but with a twist! SPOKES MEN – or as we like to call them, the Cycling Surgeons – take off from Glasgow to London with BMA news in hot pursuit. Anaesthetists Don their Aprons to Raise Dough for Lifebox Foundation – BT MyDonate takes you “behind the sugar and spice” to the surgical safety crisis at the heart of the AAGBI’s incredibly successful Great Anaesthesia Bake. “This is how the world is changed and the condition of humanity is made closer to our ideals: by the small and large contributions of individuals who care enough to become involved” – Lifebox champion Dr Mark Singleton, the ASA’s Director for California, makes a compelling case. A very powerful hour of television. How to Avoid Mistakes in Surgery sees Dr Kevin Fong exploring how other professionals make life and death decisions under pressure, from airline pilots to Formula One pit crews. If it sounds like the WHO Surgical Safety Checklist is relevant, you’d be absolutely right – and in fact Professor Atul Gawande, Lifebox chair and Dr Isabeau Walker, Lifebox trustee, are both interviewed. Saving mothers’ lives in Rwanda with SAFE training and pulse oximeters – read more about our work with the Canadian Anesthesiologists’ Society to put training and a pulse oximeter into every district hospital in this month’s Royal College of Physicians and Surgeons of Canada magazine. On foot, by car, by bus – what’s it like to spend three months following up 80 pulse oximeters spread out across Uganda? Lifebox was selected for the second year in a row as the BMJ‘s holiday charity. A wealth of articles, insights and front line action is available in print, podcast and on the BMJ blogs. For a comprehensive list of all published content, click on the link above. More exciting news from our colleagues in the U.S. – the ASA Medical Student Component has joined the Make It 0 campaign, and will be working with us to put pulse oximeters and education into operating theatres worldwide! Read more about their engagement – starting with a great night out in Washington D.C.
We recently took our environment-appropriate pulse oximeter to the Appropriate Healthcare Technologies for Developing Countries conference at the Institute of Engineering and Technology in London, and spoke to Materials World magazine about what makes the model so appropriate for a low-resource operating theatre. We also had a chance to meet colleagues with their own equipment and approaches to low-resource healthcare – fascinating. Delegates at the AANA’s recent conference in San Francisco ran/walked their way to $9,200 for Lifebox! You can read more about their success at 6:00am here. When Dr Mark Newton, of Vanderbilt University (USA) and Kijabi Hospital (Kenya) was awarded $2,500 by the American Medical Association for Excellence in Medicine, he used the funds to buy 10 pulse oximeters for areas of need in rural Africa. He has plans for many more (see p4). One year on from the launch of the American Society of Anesthesiologists’ campaign for Lifebox, we take a look back at what we’ve achieved together, and forward to what work there is yet to be done! Bringing pulse oximeters to every OR in Ecuador, through an exciting collaboration between the Alabama State Society of Anesthesiologists and the Alabama Association of Nurse Anesthetists. Students at SouthUniversity’s anesthesiologist assistant programme raised more than $1000 for Lifebox, selling badges at the American Academy of Anesthesiologist Assistants conference. Read more about their efforts here! Anaesthetists in Perth have raised nearly $50,000 to provide developing countries with about 200 simple oxygen monitors that will ensure safe anaesthesia and save the lives of patients undergoing surgery. Check out the latest edition of the Australian Society of Anaesthesiologists’ publication to read about the first Lifebox oximeters sent to Tonga, and the difficulties of providing healthcare to an archipelago population. Hear two of our Board Members, Isabeau Walker and Iain Wilson, tell the Lifebox story. ‘It’s one I would be completely happy to use’ says Professor Alan Merry in the latest issue of the Australian and New Zealand College of Anaesthetists bulletin. Atul Gawande: a career built on an obsession with deadly failures. Paediatric Anaesthetist Isabeau Walker and Obstetric Anaesthetist Kate Grady talk to Jenni Murray about Lifebox and how better anaesthetic care in labour can save lives in the developing world. Lifebox returns to Radio New Zealand, where Alan Merry talks to Kim Hill about Auckland Hospital’s leading role in developing the Surgical Safety Checklist and Lifebox’s mission to make surgery safer. Atul Gawande talks to Kim Hill on Radio New Zealand about developing the Surgical Safety Checklist, writing The Checklist Manifesto and indie rock music in the operating theatre.